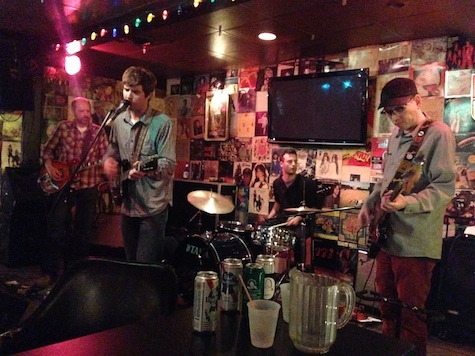 The Lupines at O’Leaver’s, Jan. 24, 2014. I realized while listening to The Lupines Friday night at O’Leaver’s along with about 40 others that I was watching a local “super group” of sorts. John Ziegler proudly carried the banner for local garage rock for years first in the controversially named Zyklon Bees then as Brimstone Howl. New drummer Calvin Retzlaff also was a member of Brimstone. Guitarist Mike Friedman is arguably one of the best guitarists in Omaha, featured prominently in Simon Joyner projects and most recently joining Little Brazil. and Mike Tulis has been a fixture in the Nebraska music scene for more than a decade, going back to Full Blown through a handful of classic Speed! Nebraska bands. So yeah, taken as a whole, The Lupines are definitely a super group, or better yet, a super garage band. Needless to say they played like the rock veterans that they are on songs that epitomize the style of music that Brimstone was known for — hard, chopping rock songs that balanced Ziegler’s vocals with Friedman’s blazing solos while a tight rhythm section held it all together. It was exactly what you’d expect from a super garage band. What more can I say other than it was a fun night of music and you should go out of your way to find a copy of the new EP, titled Over the Moon and released on the mighty Speed! Nebraska label. One last thing: There is some exciting things going on at fabulous O’Leaver’s which you may or may not know about and which I don’t know if I can talk about publicly. It’s not a huge deal, just a new opportunity for bands coming through the club. I’ll see what I can say and let you know. It’s another quiet week show-wise. In fact, I don’t see anything until Friday, when the ball starts rolling again. And with this cold weather, maybe it’s for the best…. ?